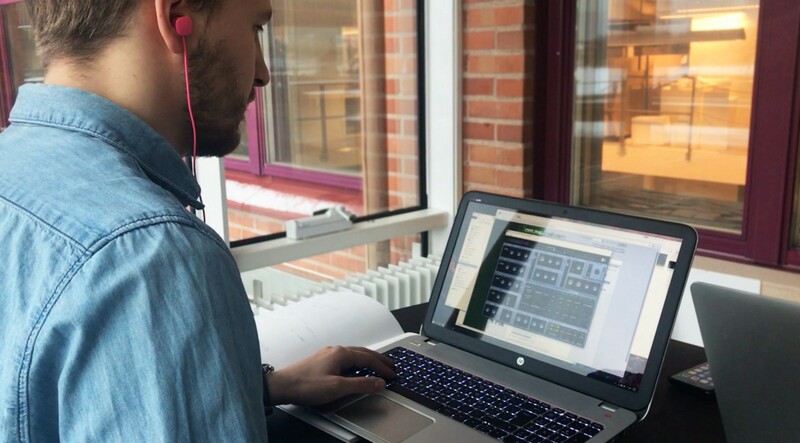 In this one-day course at Umeå Institute of Design, with the help of a music artist and professional sound designer Andreas Estensen, we focused on attributing meaning and bringing expression to a car. 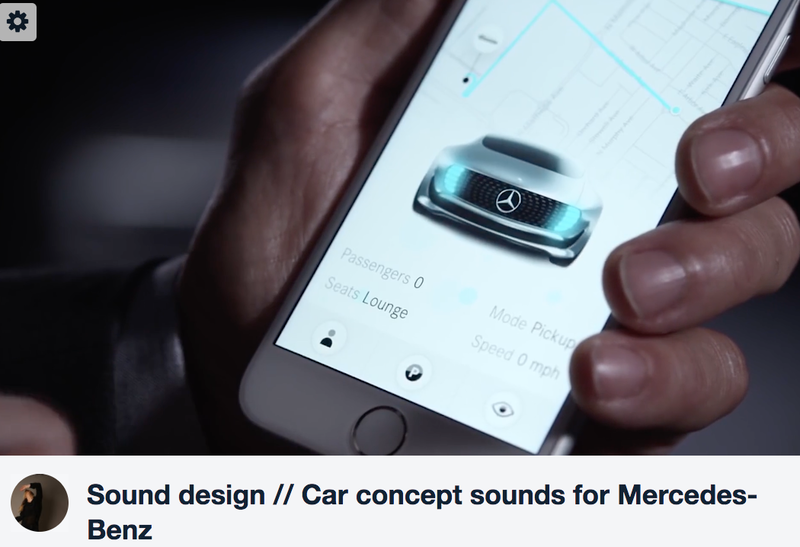 We were given the task to make a sound concept journey for the Mercedes F015 (both vehicle and the application). How would the brand express itself to sound? In the future with the technological advancement and hybrid solutions, the cars will be seamlessly silent. This requires adding fictional sounds. The people setting up the laws and regulations are increasingly worried about the safety of soundless cars. If no one would hear the cars approaching, we might be less careful on the streets. We are also triggered by the driving experience linked to motor driven vehicles. What will be the affordances? This is definitely something to look into from designers perspective. The cars not making sounds also poses a huge accessibility issue, since the only reference impaired people have for cars — are their sounds. “Sounds are potential areas in the way how a brands could market themself creating their own signature soundscapes. How did we create the sounds? Our initial task was to communicate how the sounds would look like, portray the feel of the sound, in a visual way. This is not easy - but it is often the way how sound designers communicate with each other. We made soundboards to explore these qualities. 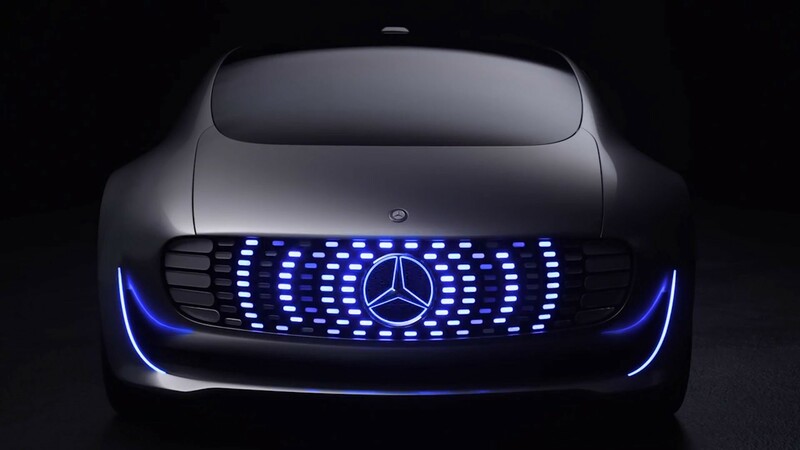 We saw Mercedes as a car brand expressing themselves — and F015 as something stable but powerful, silent but integrative and also very digital. Subsequently, we chose to make a soundboard visualizing aspects such as a humming whale, a huge buzzing server house and warping space ship representing the car accelerating. The association includes inspirational pictures to visually describe the sounds. The time envelope is how long the sound takes and what type(s) of curves it makes. This is also how many times it repeats itself, or how long time it fades. I explored the time envelopes. We constantly made funny oral noises, trying to describe the sounds to each other. Step two was to collect sounds that would fit into our vision. We literally went around sound exploring around Umeå Institute of Design. We recorded while tinkering in the workshop, stroking and bashing weird objects together. We walked around with bike tires, trying to mimic sounds that a car could possibly make. The hardest part was to find that exact precise sound, as the one mimicking wheels grasping against the pavement. In the end, we searched for online sound resources. Many of the “good tones” and tunes you can find in the oddest of videos, such as in children's fairytale clips. As the interaction designer in the team I was especially responsible for the application sounds, find a good solution to the click /confirmation feedback and sounds for when the car approached the user in the video. When searching for UX sounds, the ones that often appear are the ones based on native notions. I found it hard to encounter UX sounds intended for other things than for particular use cases for mobile apps. It would be great to have more resources to sounds out there. Maybe you have better knowledge of where to find them? How will the car approach us in the future? Sound editing programmes play an important part. Old school Audacity, and Massive is a great resource for editing sounds. Massive is a programme that many famous DJ:s around the world use on a daily basis. Reverb and fade are the terms forever stuck in my head. We actually used the trickle down sound from tinkering with iron threads in the school basement, and the car tyre sounds from recording a rolling wagon. Our final result you have already seen. What do you think about the future of sound packages linked to cars? How can a brand further express their core values with sounds? 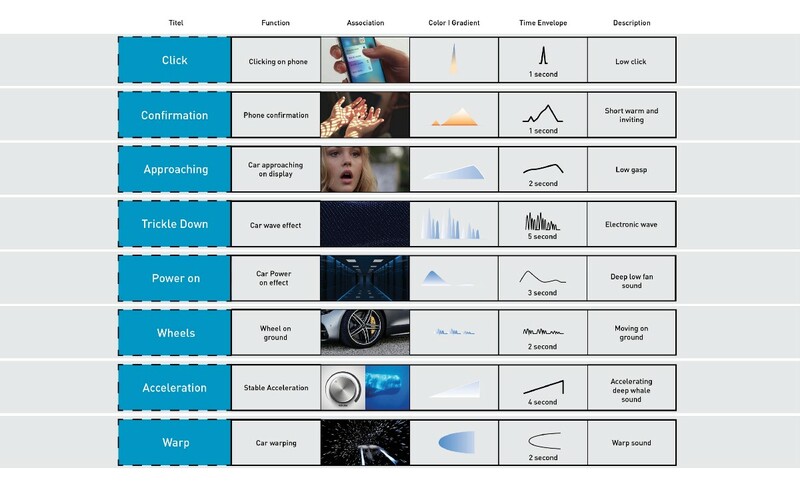 Will sounds play an even more important part of the UX and the car experience? Most probably, yes. There are many questions and topics that will be interesting to explore. Personally, I am interested to see the reality in how sound designers tackle their work process. It is hard to plan sounds. They are what in artistic terms would be called “happenings” in their nature, so how could we possibly know the result before the end of this project? For me, this was a great and short exploration, which often reveals the best outcome — when you feel little pressure and when you have good fun.